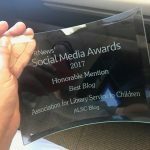 Each month, we work to profile an ALSC member, and learn a little about their professional life as well as a bit about their not-so-serious side. Using just a few questions, we try to keep the profiles fun while highlighting the variety of members in our organization. 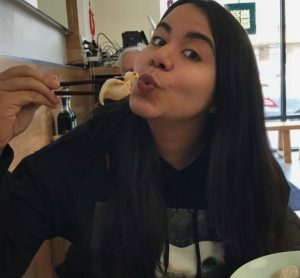 So, without further ado, welcome to our ALSC profile, ten questions with ALSC staffmember, Elizabeth Serrano. What do you do, and how long have you been doing it? I am the new Membership Marketing Specialist for ALSC! I’ve been on board for an ENTIRE 3 weeks. I’ve been in the non-profit world for about six years. As the new ALSC Membership Marketing Specialist, what aspect of your position are you most excited about? Right now I’ve been pretty excited about everything! Coming into a new position and learning the ins-and-outs has been fun. 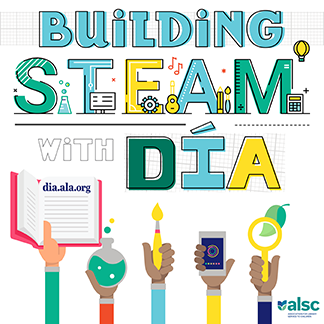 I am excited about connecting more with our members and learning about what they do and how being a part of ALSC has helped them. What are you looking forward to at the ALA Annual Conference? It will be my first Conference! I’m really looking forward to ALSC 101! It will be a fun introduction to ALSC and Annual and I’m looking forward to connecting more with a bunch of new and experienced members. Do you have any big summer plans? I’m planning on going to Kansas City, MO for my birthday. I’m a big BBQ girl and I hear only good things about the food there, so I want to go eat it all. I’ve also embarked on a mission to visit all of the baseball stadiums across the US, so Kauffman Stadium will be another to add to the list. Do you celebrate any holidays in the summer? Does my birthday count? I’m a July baby! I love the ocean and marine life. Anomaly is my favorite word. I first really learned the word when Incubus came out with a song titled “Anna-Molly” (pronounced anomaly). My nick-name is Elly, so it all sparked my social media handles: @anom_elly (pronounced anomaly). I love surprises and doing things out of the ordinary, so I thought it fit me well. Haha! When I was younger I wanted to be a pediatrician. I loved kids so much I wanted to help them. Although I am not a doctor, I am very happy and fortunate to have been given the opportunity to work for non-profits that are dedicated to helping communities and the children inside them. I plan on continuing this path. What do you think children’s librarians will be doing 25 years from now? I almost want to say I don’t know what they WON’T be doing 25 years from now. When I was younger, I used to really only associate librarians with being these nice people who love books and computers, and although they are very nice people who love books and computers, I’ve learned (and am still learning) that they are so much more! I’ve read articles about librarians starting children’s cooking clubs, father-daughter building programs, and social clubs for children and adults with special needs; all of these amazing things. I’ve also recently read about Librarians tending to heroin overdose victims. They are so many things in one body, it’s really incredible. I’m happy to be working with an organization that’s helping me learn all of this. What type of books do you like to read? I am a huge fan of middle-grade, and YA novels. Two of my favorites written for children, THE ABSOLUTELY TRUE DIARY OF A PART-TIME INDIAN by Sherman Alexie and STARGIRL by Jerry Spinelli. In the more adult realm, I love non-fiction (mostly memoir), my favorite being THE GLASS CASTLE by Jeannette Walls (SO excited the movie is coming out!). Thanks, Elizabeth! What a great continuation to our monthly member profile feature! Do you know someone who would be a good candidate for our ALSC Monthly Profile? Are YOU brave enough to answer our ten questions? Send your name and email address to alscblog@gmail.com; we’ll see what we can do! Congrats on your new ALSC position!